What is IRS Form 1099-Q? If you're paying for school expenses from a 529 plan or a Coverdell ESA, you will likely receive an IRS Form 1099-Q, which reports the total withdrawals you made during the year. If you contribute money to a qualified tuition program, such as a 529 plan or a Coverdell ESA, you will likely receive an IRS Form 1099-Q in each year you make withdrawals to pay school expenses of the beneficiary. The 1099-Q reports the total of all withdrawals you make during the year; however, some of this amount may be taxable depending on how you spend the money. A Coverdell ESA and 529 plan operate in a similar fashion and provide the same type of tax savings. Essentially, these are accounts that are set aside to pay the school expenses of the beneficiary. The plans have some key differences in what educational expenses they cover but their tax treatment is essentially the same: you invest money on behalf of a student (which can be yourself), the investment profits are tax-free and distributions that go to pay qualifying educational expenses are not subject to income tax. Form 1099-Q comes from the administrator or bank that manages your 529 plan or Coverdell ESA. If you set up the account and make contributions to it, then you are the owner and are the recipient of the 1099-Q. If you create one of the accounts to put someone other than yourself through school, that student has no control over the funds and is not responsible for any of the tax consequences. The 1099-Q provides three key pieces of information. Box 1 reports your annual distributions or withdrawals from the account. The second box reports the portion of the distribution that represents the income or earnings of your initial investment. Finally, box 3 reports your basis in the distribution. Essentially, this is the amount of your distribution that relates to original contributions you make to the account. The form also includes information on the type of account you own and amounts, if any, that you transfer between two qualified tuition plans. If the distribution doesn’t exceed the amount of the student's qualifying expenses, then you don't have to report any of the distribution as income on your tax return. If the distribution exceeds these expenses, then you must report the earnings on the excess as "other income" on your tax return. When you pay a student’s school expenses with these funds, you cannot claim a tuition deduction or either of the educational tax credits for the same expense. The administrator of your qualified tuition plans must send you the Form 1099-Q in any year you take a distribution or transfer funds between accounts. 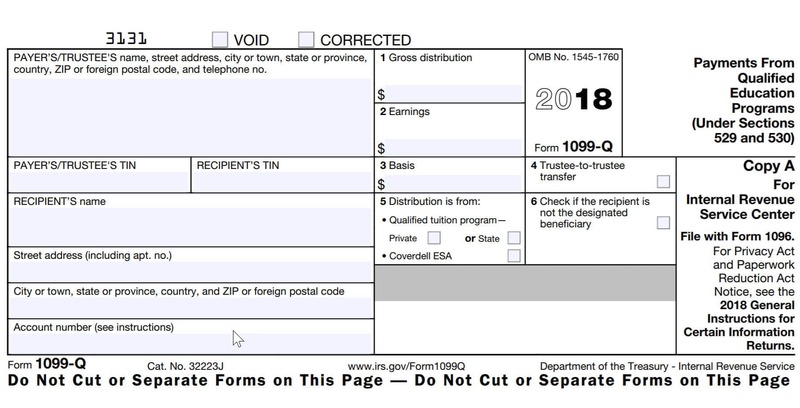 You should receive the 1099-Q no later than early February following the close of the tax year since the administrator must send it by January 31. Administrators must also provide a copy of each form to the IRS no later than March 31 if sent electronically, or February 28 if using a paper copy. Video: What Is a 529 Plan Contribution? What Is IRS Form 8917? What is Form 1098-E: Student Loan Interest Statement? Taxes for Grads: Do Scholarships Count as Taxable Income?